The new technique at SaWo is to create something using mosaics, either stamped or with paper. 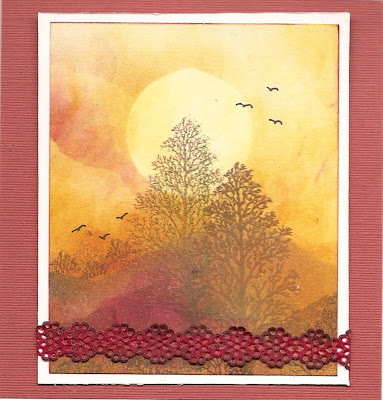 The challenge at TMTA is to create an ATC using cloth and paper. My background is a piece of batiked cotton. 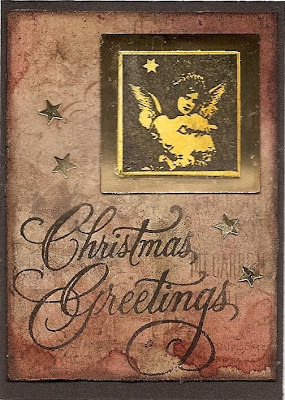 I added stamps, gold detail and an image. Unfortunatelt the scan does not do justice to the background at all which is actually much warmer in colour and golden shimmery. There is a new challenge blog on a Friday, run by a group of very creative Dutch ladies. Every Friday they will post a new image for anyone to create with. 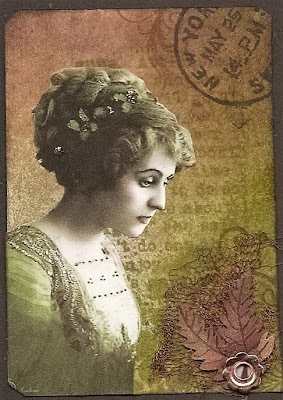 This weeks image is this lovely dreamy lady. Saturdays Workout "Split negatives technique"
The theme at Thank God It's Friday is Vintage today. Most people seem to like Vintage. I suppose it brings warm fussy feelings of the past and supposedly better times. 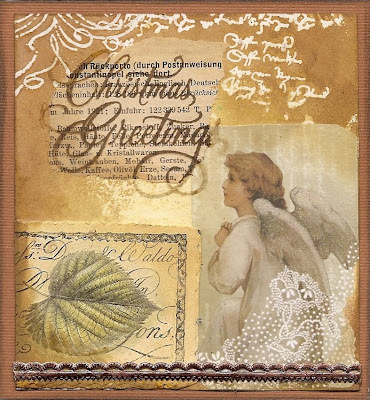 This seems to come up particularly around Christmas time.... As I am still busy doing Christmas cards, I made another vintage card. The theme at MMM is "Ornamental Christmas". 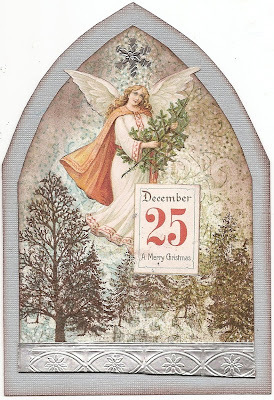 My contribution is a Gothic Arch which I made for a contest over at Gothic Arches. 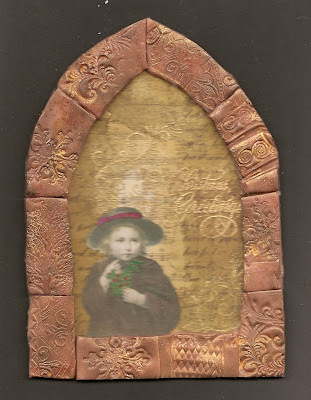 The frame is made of Polymer Clay, stamped and coloured with mica powders. 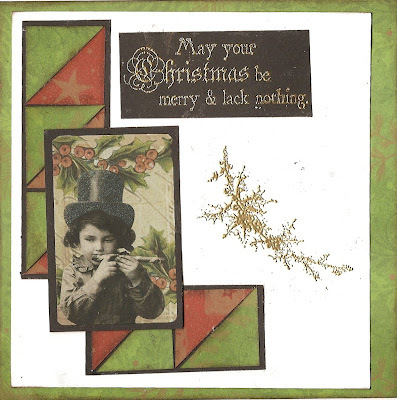 The background is collaged, coloured with dye inks and overstamped and embossed. The image I had in my collection and I cannot remember where it came from. Silhouette is the theme at Gothic Arches. Really liked the idea of that, it gave me the chance to use a little silhouette stamp I got not that long ago. 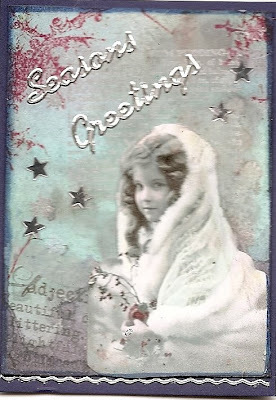 Mine has a wintery Christmas theme (as most of my things do at the moment. 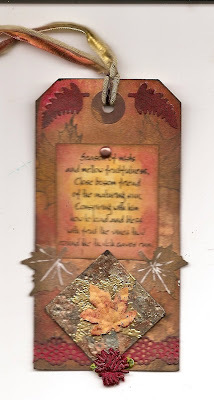 Background was done with Adirondack dye inks and a brayer. 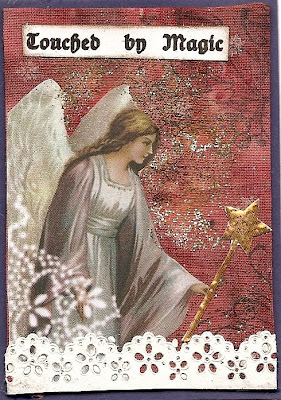 The theme at SaWo is to create a background by using the thread technique. Great fun to do and dead easy. Unfortunately my background has almost disappeared, but right at the top you can just see it still. The theme at TGIF is "Hats" or headgear. 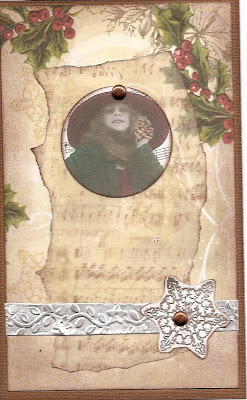 Mine is a Christmas ATC. 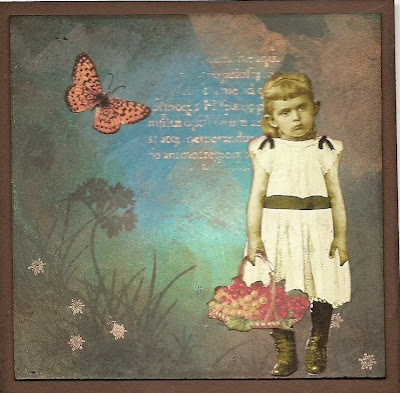 The image is from Digital Collage's ATC collection. 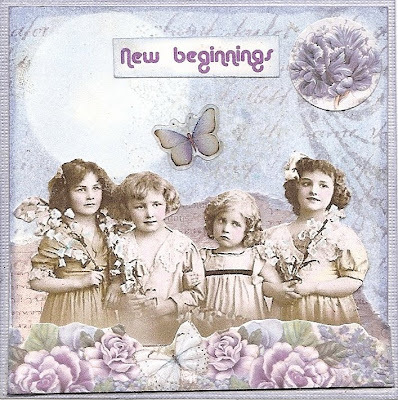 The theme at Think Monday Think ATC is colour of the week and this week it's lilac. 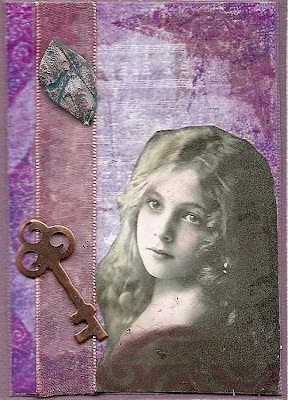 I love monochromes, and lilac always suggests something slightly dreamy to me. 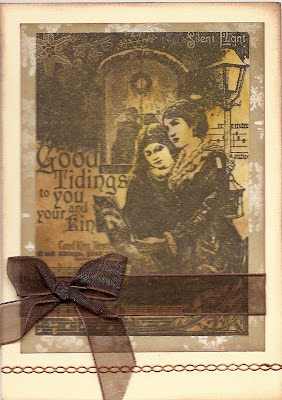 The image is from Digital Collage. The theme at Gothic Arches is "Buttons". Buttons are not actually my thing, I never can quite see the point of them (no offence Dawne, your card is amazing!!) Anyway, as Gothic Arches is probably my favourite challenge site, I decided to use it as a real challenge. So I have used lots of little buttons, but kind of disguised them in my ladies hair band and as the centre of the flowers I used as embellishment. The theme at SaWo is to antique paper. Really liked the idea of this theme, Sandy is so clever to think of something new every week. 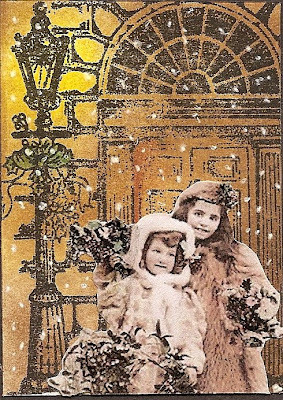 Anything I do at the moment seems to eventually turn into a Christmas card. 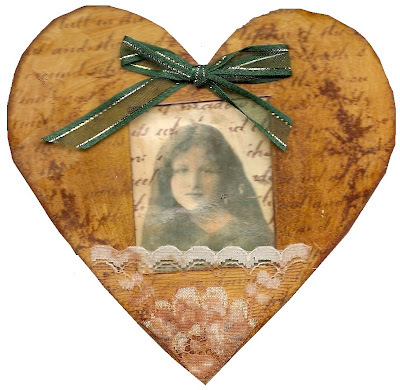 I made an antique heart, using mount board and sticking a little transferred image (using Golden gel medium) behind the aperture that I cut out. 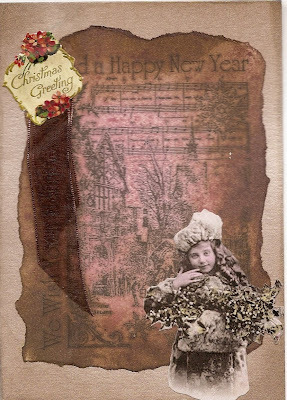 I used distress inks and then varnished everything with tea dye varnish to give it the antique look.Then like I said , I could not help myself and turned it into a Christmas card. The theme at Thank God it's Friday is "Doors". 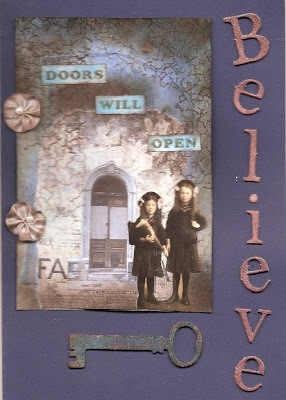 I love doors as they can be so symbolic, being like a threshold between two worlds. Anyway, it's really too early for philosophy, so here is my door card. The rusty looking key is just grungeboard treated with some mica and embossing powders. Mixed media Monday "Colours of Autumn"
The theme at MMM is Colours of Autumn". 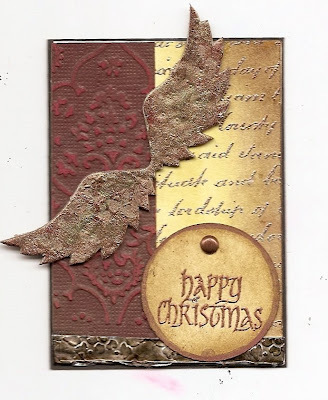 Decided to do a stamps only piece for a change using a brayer Ranger dye inks and stamps from clarity stamps. 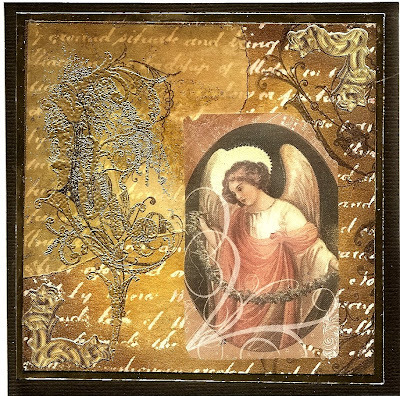 Think Monday Think ATC "Angels"
The theme at Gothic Arches is vinatge children. 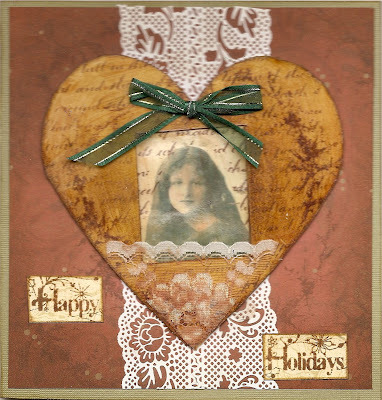 Here is mine, the images are from Lisa's altered art. Saturday's workout "Waxpaper or beeswax"
The theme at SaWo this week is to make something with either wax paper or to use beeswax. As I have neither wax paper nor a cuttlebug, the other thing necessary for the particular technique described in the "technique zone", I decided to use beeswax. 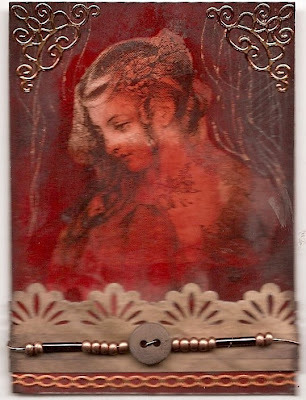 I created a background using a resist technique involving clear embossing powder, as the effect is actually quite similar to the wax paper technique in some respects. 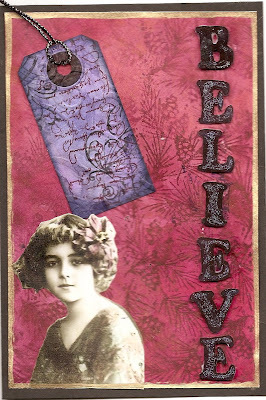 You stamp a background using versamark and then emboss with clear embossing powder. You then colour your piece in whatever way, I sponged with adirondack inks from Ranger. 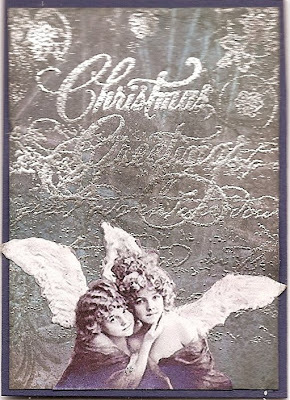 The embossed images resist the colouring. 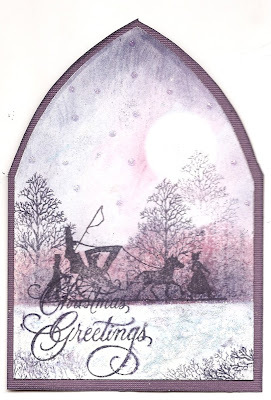 Using some kitchen paper you then iron your piece, this melts the clear embossing, so that your stamp background now appears as a lightcoloured "resist". 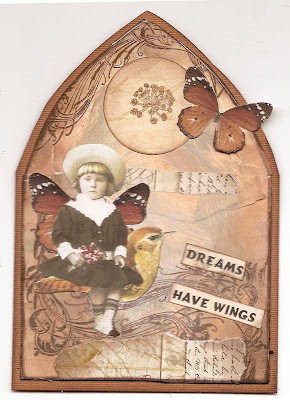 After that I collaged with melted beeswax from the melting pot. Collage images are from "Digital Collage". 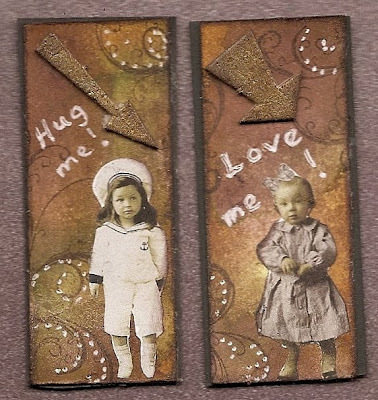 Wednesday stamper has a free theme this week. 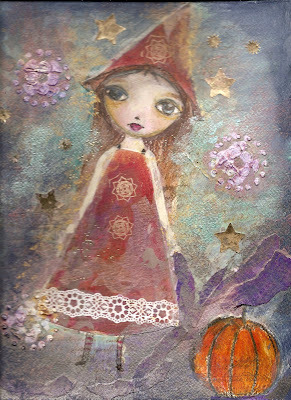 I decided to enter with a mixed media piece which i have titled "Friendly Witch". It is strongly influenced by Suzi Blu's techniques. 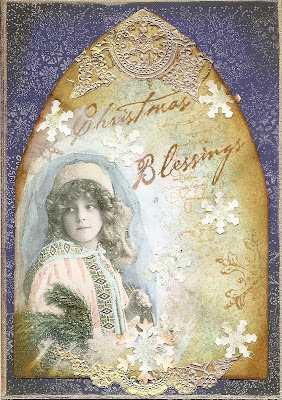 It is mostly hand painted but contains various background stamps, even though in the scan these are hard to see. 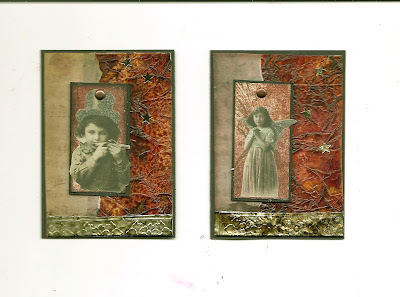 The theme at Wednesday stamper is to alter your favourite object. 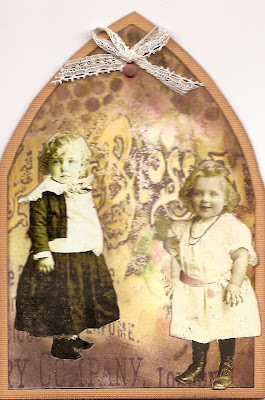 I love altering, but up until now i have never put any of my altered things on my blog. Mainly because i am a hopeless photographer and up until now, was unable to get things from my camera onto my computer. However, tonight with my OH lovingly hanging over me I decided it was time to get over my technophobia. 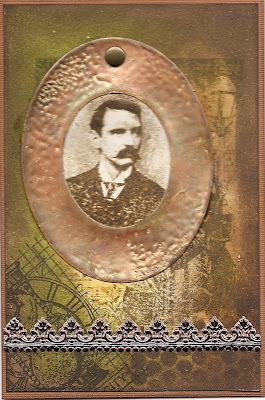 So here is my altered object, a tobacco tin formerly belonging to said OH. 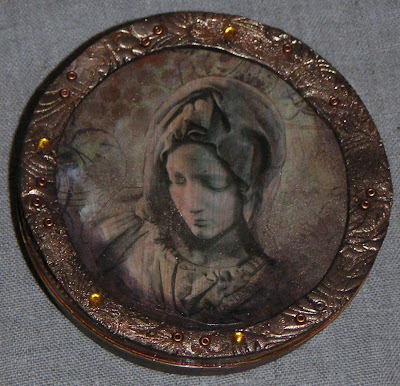 The stamping happened mainly on the polymer clay surround, but also a little on the tin itself. 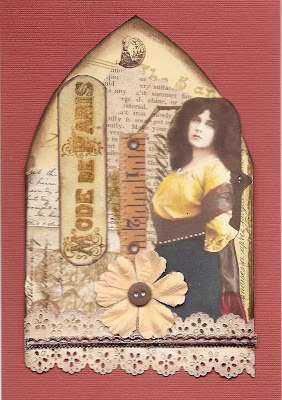 Paper Patchwork is the theme at Gothic Arches this week. A fun technique which I have used quite often, without knowing what it was called. 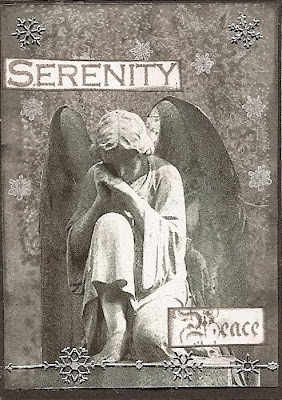 The image I used is from Digital Collage. The theme at Saturday's workout is actually a wonderful German proverb, that I know works in dutch too, but I have never actually come across in English, namely, broken glass or any chards really, bring luck! What a wonderful thought and a great comfort after you have, say, just broken your most favourite plate, glass or whatever. 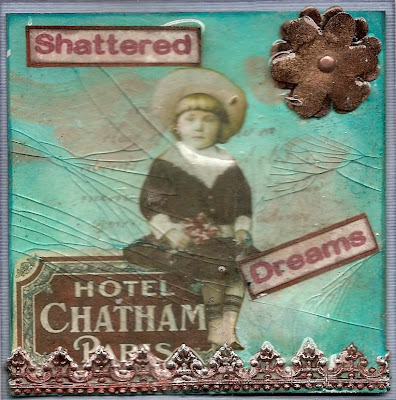 Anyway, the idea is to create a piece of art with "broken glass" in it. Decided to use the fake method of using Utee. I've had this happen to me a few times when I did not really want it to happen, so it was very satisfying, to do it purposely for once. Make a Moo or Two "Arrows"
The theme at Make a Moo or Two is Arrows. Arrows actually really aren't my thing, but as I had quite a few unused arrows among my grunge board elements, i thaught I'd give it a go. Mixed Media Monday "Purples and Blues"
The theme at MMM is Purples and Blues. The example by Rosie is just stunnings. Blues and purples always seem to evoke a kind of mystical feel. I decided to stick with Blues rather than purples, mainly because I have no decent purple colour at the moment. 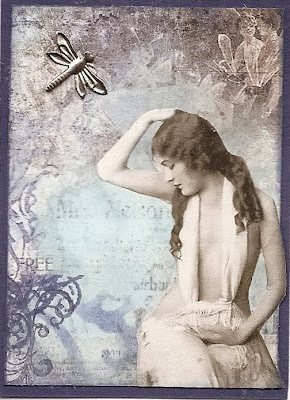 I've given my contribution the title "Feeling Blue"
Think Monday Think ATC "Ophelia"
The theme at TMTA this week is Ophelia. In a way I like this theme, as it will be interesting to see what people come up with, what essencially is the use of a particular stamp, at least I guess so. On the other hand, if you don't own that stamp, what can you do? Well, it will be interesting to see... I do own the stamp used in the example on the site. 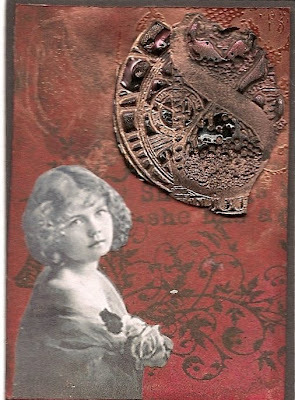 I did this ATC quite a while back and swapped it with a friend. The theme at Gothic arches this week is "Haute Couture". 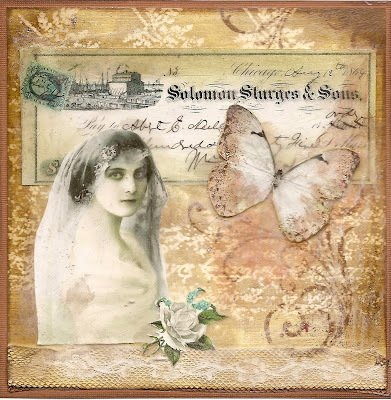 I probably did not actually meet the theme completely, but I had this gorgeous new digi collage sheet from Digital Collages who have just got a new website (it's great, check it out!). I really wanted to use some elements of that sheet, so used them for this arch. The theme at "tag you're it" is Autumn. There are some super examples on the blog. The theme at TGIF is "dolls". 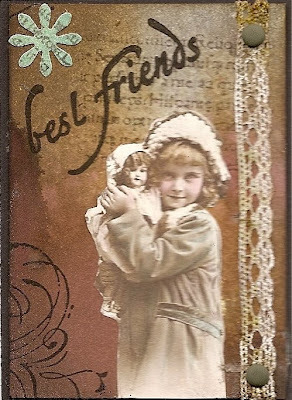 Would love to have made an art doll or something, but like usual time ran out, so my contribution is a modest little ATC. 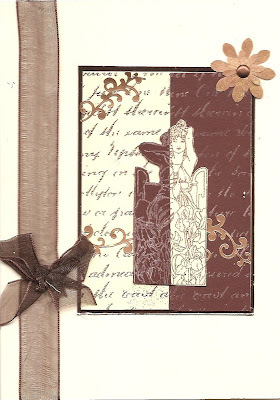 The theme at Wednesday stamper this week is to use brown in combination with another colour. As brown is one of my favourite colours, this was kind of easy. I decided to make a 4 x 4. The main stamp I used was from "Clarity Stamps"